This week’s episode of Raw doesn’t quite hit the heights of the last few weeks, and a big part of that is because of the pacing. For the first time in awhile everything feels out of sync; the matches are run in a perplexing order, the segments feel out of touch with the build to Summerslam, and the obvious main event wraps up shortly after 10pm. The pacing is off from the get-go, as Kurt Angle looks to make a short and sweet announcement about the night’s matches, only to have Brock Lesnar and Paul Heyman come out just as he’s making his exit. The initial surprise of seeing Lesnar is great, and Heyman’s promo hits all the right notes, laying out that it’s unfair to put Brock in a Fatal Fourway match while also suggesting that the reason for doing so is UFC-related. As good as the promo is though, it’s the first sign that the next three hours will be a little off, as the lengthy segment is as meandering as the rest of the night. Look, it makes sense that WWE would just have Heyman vaguely talk about the UFC stuff with Lesnar, but I’m not sure the feud needs that angle. The whole “Brock will leave WWE if he loses” doesn’t fit in with the build so far, which is all about three practically flawless guys chasing an unbeatable monster. The real-world tie-in defangs that angle a bit; you never want to hear that the champ is ready to leave (obvious example excluded). Remember when it looked like maybe the Hardys were going to go through some hard times, and the tag division could start building some new stars on the backs of their newly re-signed veterans? Well, this week the Hardys are laying out both Gallows and Anderson and The Revival. So it goes. This week’s lone bit of good storytelling comes, once again, from Seth Rollins and Dean Ambrose. Their story of betrayal and attempted redemption plays out across the entire three hours, with two backstage segments and an in-ring, post-match beatdown. Rollins has never really reckoned with his past actions, even when he was feuding with Triple H. Now, he’s seeing the personal toll of those chair shots when he broke up The Shield. It’s beautiful storytelling, with Rollins trying to get Dean to see how well they still work together, and Ambrose understandably still unable to forgive his former brother for what he did. WWE isn’t rushing this, and that bodes well for whatever plans they have for both Rollins and Ambrose. I really don’t have much to say about the Miz TV segment with Jason Jordan. On the one hand pairing Jordan with the Miz in a promo segment only highlights how stiff the former is. On the other hand, nobody goes through a feud with the Miz and comes out lacking momentum. The Miz is the perfect starter feud for any call-up or revamped wrestler. I genuinely hope Jordan can succeed; he’s a great in-ring talent with a lot of potential. First things first though? Scrapping that generic theme music and giving him something much more impactful. You know what else doesn’t have any sort of impact? 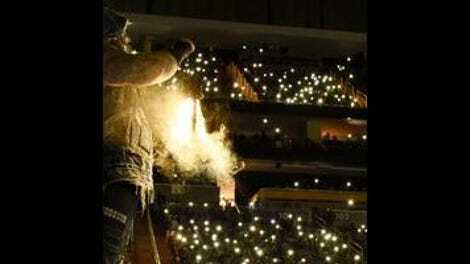 A Bray Wyatt promo. It’s been a problem for a long, long time, but his back-to-back feuds with Seth Rollins and now Finn Balor have really shown how generic they can be. Wyatt just runs through the same old talking points about sins and darkness and…who even cares? Wyatt is a great talker, and yet he’s stuck spouting nonsense that doesn’t have any meaningful tie to whoever he’s feuding with. How is Brock Lesnar going to show up at the top of the show and not then find a way to lay some folks out during the Triple Threat match between Braun Strowman, Roman Reigns, and Samoa Joe? So, Elias Samson is now just “Elias,” and he’s gone from feuding with Finn Balor to feuding with Kalisto, who is apparently still someone employed by WWE. That’s quite the demotion. What’s even left to say about this week’s Raw? The highly touted Triple Threat match comes on close to 10pm and doesn’t deliver much beyond a Reigns win; Bayley has yet another match with Nia Jax and wins via countout, which Michael Cole promptly calls “an emotional win” because words don’t mean anything behind that announce table; then Big Show and Cass main event the show, with Enzo cutting a promo about bruised bananas for some reason. What an absolute mess. 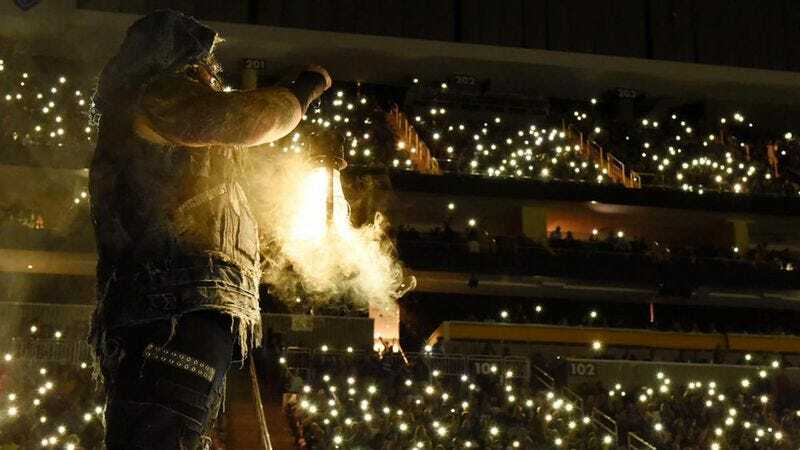 None of this derails Raw‘s stellar Summerslam plans, but it does make this week’s show one of the worst the Red Brand has done in quite some time. And with that said, on to some bad news: this will be the A.V Club’s final Raw post. I can’t really express how much I’ve enjoyed writing about this show every single week, even when it tested my patience, and I’ve been uplifted by the engaged, welcoming, opinionated comments section. I’m immensely proud of the work myself, Alasdair Wilkins, and LaToya Fergsuon—who will be penning the final Smackdown! Live post tomorrow—have done here week in and week out. This is getting into egotistical territory, but I believe we came at WWE from a different angle, offering up something that you don’t see when it comes to wrestling writing anywhere else on the internet. Thank you so much for reading these reviews and discussion posts. It’s truly been a pleasure. Hopefully I’ll see you somewhere down the road, when I emerge from the back of an ambulance and announce my return.